Variable (combo box) – This allows you to select the input variable. 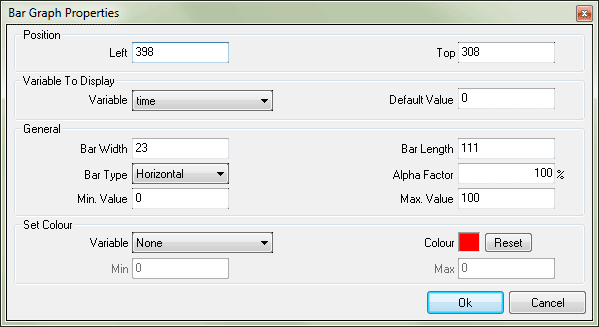 At run time the current value of the variable will be displayed in the form of a bar graph inside this control. This property can be changed by dragging and dropping the appropriate variable from the variables pane in to the body of the control in the design area. Bar width (textbox) – This is the width of the bar graph. When using a horizontal graph, this specifies the width of the graph in the vertical direction (y-axis). When using a vertical graph, this specifies the width of the graph in the horizontal direction (x-axis). It should be noted that the size of the bar graph can be altered by resizing the control on the design area. Horizontal – Here, as the variable value increases, so too does the length of the bar in the horizontal direction (x-axis). Vertical – Here, as the input variable increases, so too does the length of the bar in the vertical direction (y-axis). Min and Max values - For Min and Max, you can assign two values from the range of values which input varible can have. *If Min value is less than the Max value, length of the indicator bar increases from left to right. *If Min value is greater than the Max value, length of the indicater bar increases from right to left. Variable (combo box) – the foreground colour of the bar graph can be based on variable. By selecting a variable the colour property is disregarded. Based on the value of the variable, colour of the bar will change from blue to red as indicated by the below image.